I’m not keen on the little loom frame kits you can get as I find using a needle to weave the threads very frustrating. I could remember having a toy loom as a child in the 70s which had a bar which I could turn which would lift and lower the threads so I could pass a shuttle through. I did some reading up and originally thought I’d have to get an inkle loom which is great for making belts or guitar straps. They can be used to great effect to form intricate designs. I didn’t rush to buy as I had quite a few things on at the time, just regularly keeping an eye out seeing what was on offer. Then in August I happened to find a Brio “toy” heddle loom on Ebay. 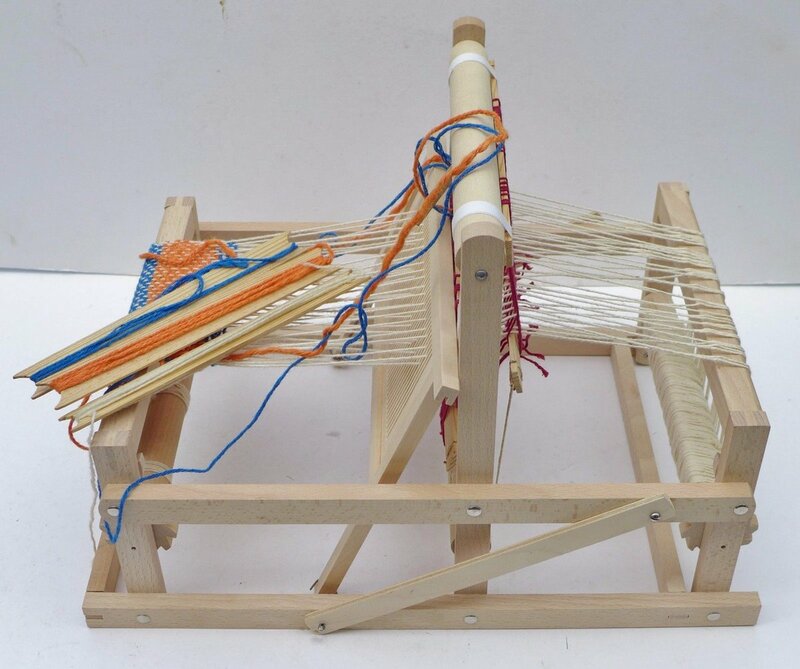 It may be described as a toy but it is a fully functioning loom which can produce a fabric 6 inches in width giving much more flexibility. I am totally blown away by its design. It can be stored folded flat (about 3 inches deep) even when set up making storage much easier and I have to admit that it is where it has been for the last year, propped up in the corner of the room.